Godiva chocolate is delicious. It’s tasty with a nice texture and flavour. They have a great range of classic chocolate blocks (tablets) to hot chocolate drinks. It can be expensive though so I have been wondering how to buy it at a more affordable cost. Well, there is a way to buy Godiva chocolate cheaper in Singapore, by buying it directly from the Godiva US online store. I’ll explain how in the step by step guide below. Before I jump into that, here’s a contrast of the US and Singapore prices for the same block of Godiva chocolate. 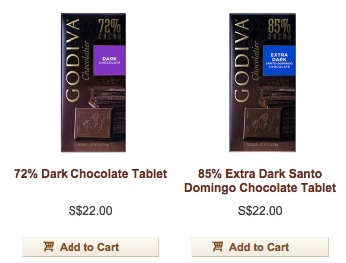 Prices for Godiva chocolate blocks (tablets) such as “72% dark chocolate tablet” and “85% Extra Dark Santo Domingo Chocolate tablet” are $22 SGD in Singapore. This is for 100g (3.5 oz) size. Prices for Godiva chocolate blocks (tablets) in the US. The same type of 100g (3.5 oz) size of chocolate blocks is selling for $3.99 USD across the same range of chocolate tablets. In this example, we are looking at the “72% dark chocolate tablet“. While looking at these numbers, buying Godiva from the US makes more financial sense. However, we do need to factor in the International shipping costs and taxes too to evaluate if buying Godiva chocolate from overseas indeed will save you money than buying them from inside Singapore. This option only works well for you too if you don’t mind waiting 1-3 weeks for your chocolate to arrive at your doorsteps. So let’s jump right into it now. Here’s how to buy Godiva chocolate cheaper in Singapore. Start shopping on Godiva‘s US online store and use your new US address. Once all your Godiva chocolate (along other items from other US online stores if you brought other things) arrive at your comGateway address, then when you’re ready, to ask them to ship them to your home. Step 5 – Enjoy your Godiva chocolate! 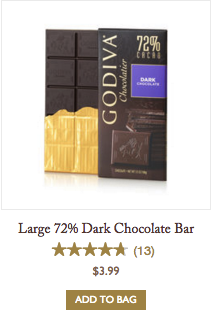 Enjoy your Godiva chocolate, shipped directly from the Godiva US store. If you’re wondering what my own purchase was like. I brought about 278 SGD worth of Godiva chocolate from the Godiva US online store. This is compared to buying the same for 123.95 SGD. Please see my breakdown below. Using comGateway’s Time and Cost calculator, the International standard shipping cost is 24.80 USD. That’s about 36.47 SGD for the shipping costs. Total costs for the Godiva purchase is $84.29 USD which equals 123.95 SGD. Sound good? Check out more details here at comGateway. Happy shopping!